UPDATE: I discovered a new cereal using honey roasted chickpeas! They are delicious and stay fairly crunchy up to the last bite. Check out my Crunchy Roasted Chickpea Cereal! 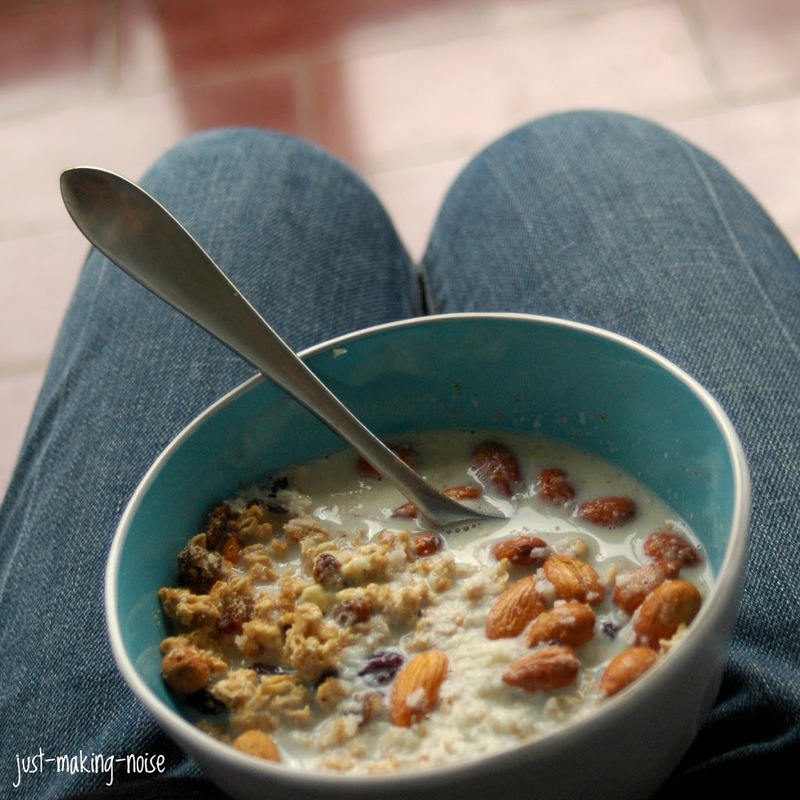 I am loving having these oats in hand… made cookies and now this cereal, I have more ideas brewing in my head! I woke up not really feeling like having eggs or toast or anything special. Looking around my fridge, I saw the oats and this idea popped in my head… have some cereal! It has been SO LOOONG since I had a bowl of cereal. Dry breakfast cereals are produced by a process called extrusion. Cereal makers first create a slurry of the grains and then put them in a machine called an extruder. The grains are forced out of a little hole at high temperature and pressure. Depending on the shape of the hole, the grains are made into little o’s, flakes, animal shapes, or shreds (as in Shredded Wheat or Triscuits), or they are puffed (as in puffed rice). A blade slices off each little flake or shape, which is then carried past a nozzle and sprayed with a coating of oil and sugar to seal off the cereal from the ravages of milk and to give it crunch. In his book Fighting the Food Giants, Paul Stitt tells us that the extrusion process used for these cereals destroys most of the nutrients in the grains. It destroys the fatty acids; it even destroys the chemical vitamins that are added at the end. The amino acids are rendered very toxic by this process. The amino acid, lysine, a crucial nutrient, is especially denatured by extrusion. This is how all the boxed cereals are made, even the ones sold in the health food stores. They are all made in the same way and mostly in the same factories. All dry cereals that come in boxes are extruded cereals. The only advances made in the extrusion process are those that will cut cost regardless of how these will alter the nutrient content of the product. Cereals are a multi-billion dollar business, one that has created huge fortunes. Let me tell you about two studies which were not published. The first was described by Paul Stitt who wrote about an experiment conducted by a cereal company in which four sets of rats were given special diets. One group received plain whole wheat, water and synthetic vitamins and minerals. A second group received puffed wheat (an extruded cereal), water and the same nutrient solution. A third set was given only water. A fourth set was given nothing but water and chemical nutrients. The rats that received the whole wheat lived over a year on this diet. The rats that got nothing but water and vitamins lived about two months. The animals on water alone lived about a month. But the company’s own laboratory study showed that the rats given the vitamins, water and all the puffed wheat they wanted died within two weeks—they died before the rats that got no food at all. It wasn’t a matter of the rats dying of malnutrition. Autopsy revealed dysfunction of the pancreas, liver and kidneys and degeneration of the nerves of the spine, all signs of insulin shock. Results like these suggested that there was something actually very toxic in the puffed wheat itself! Proteins are very similar to certain toxins in molecular structure, and the pressure of the puffing process may produce chemical changes, which turn a nutritious grain into a poisonous substance. Another unpublished experiment was carried out in the 1960s. Researchers at University of Michigan were given 18 laboratory rats. They were divided into three groups: one group received corn flakes and water; a second group was given the cardboard box that the corn flakes came in and water; the control group received rat chow and water. The rats in the control group remained in good health throughout the experiment. The rats eating the box became lethargic and eventually died of malnutrition. But the rats receiving the corn flakes and water died before the rats that were eating the box! (The last corn flake rat died the day the first box rat died.) But before death, the corn flake rats developed schizophrenic behavior, threw fits, bit each other and finally went into convulsions. The startling conclusion of this study is that there was more nourishment in the box than there was in the corn flakes. Most of America eats this kind of cereal. In fact, the USDA is gloating over the fact that children today get the vast majority of their important nutrients from the nutrients added to these boxed cereals. Cereals sold in the health food stores are made by the same method. It may come as a shock to you, but these whole grain extruded cereals are probably more dangerous than those sold in the supermarket, because they are higher in protein and it is the proteins in these cereals that are so denatured by this type of processing. I don’t know about most of you, but back when I ate cereal… I would always feel tired and sick to my stomach afterwards. Even when I switched over to organic cereals, I still felt yucky and sometimes worse then before. The only “cereal” that is an exception is Ezekiel 4:9 Sprouted Whole Grain Cereal, which I’ve tried and enjoyed occasionally… but it is a bit pricey for us. Now, I know why I felt so bad after eating cereal… my body was screaming at me to stop. eating. that. stuff! I don’t miss cereal anymore because I’ve learned to live without it and am now enjoying more nourishing breakfasts like crepes, smoothies, oatmeal, muffins, pancakes, fritatas & more! What do I need cereal for?! Ah… yes… well… I know most will say it is… convenient… my hated word. I’ve learned that oatmeal can be made in minutes if soaked overnight. Time-wise, how is frying a few eggs any different from prepping a bowl of cereal? 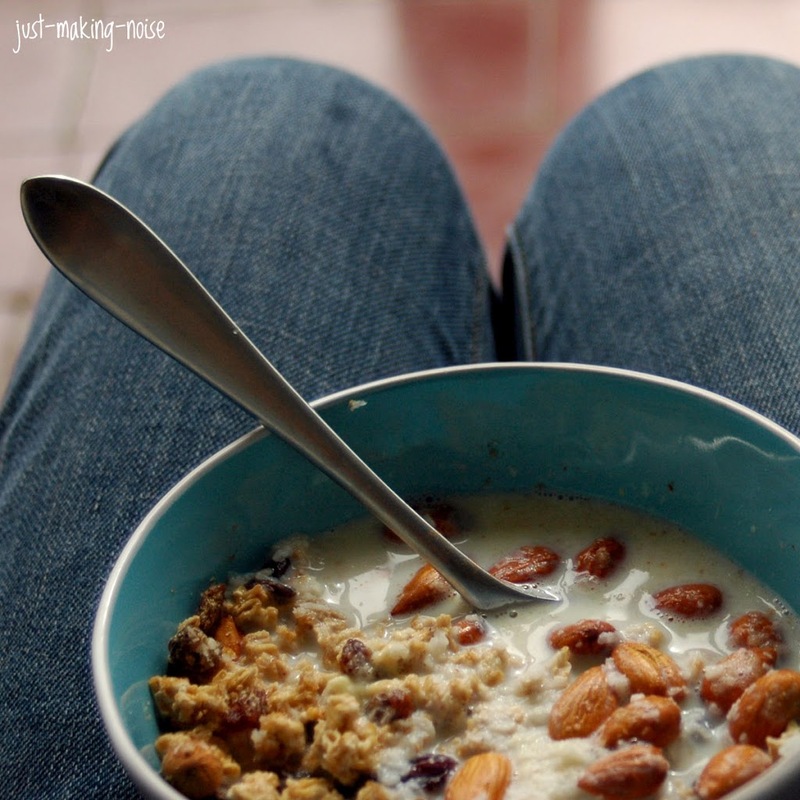 So, here I am… happy to share with you a nourishing cereal that left me feeling satisfied and energized all morning! It is so simple that it can be labeled “convenient” and you can totally create your own mix ins. That morning I made a mixture of dehydrated almonds, raisins, coconut flakes, cinnamon, freshly ground flaxseed and raw honey with the ‘Soaked & Ready’ Oats. 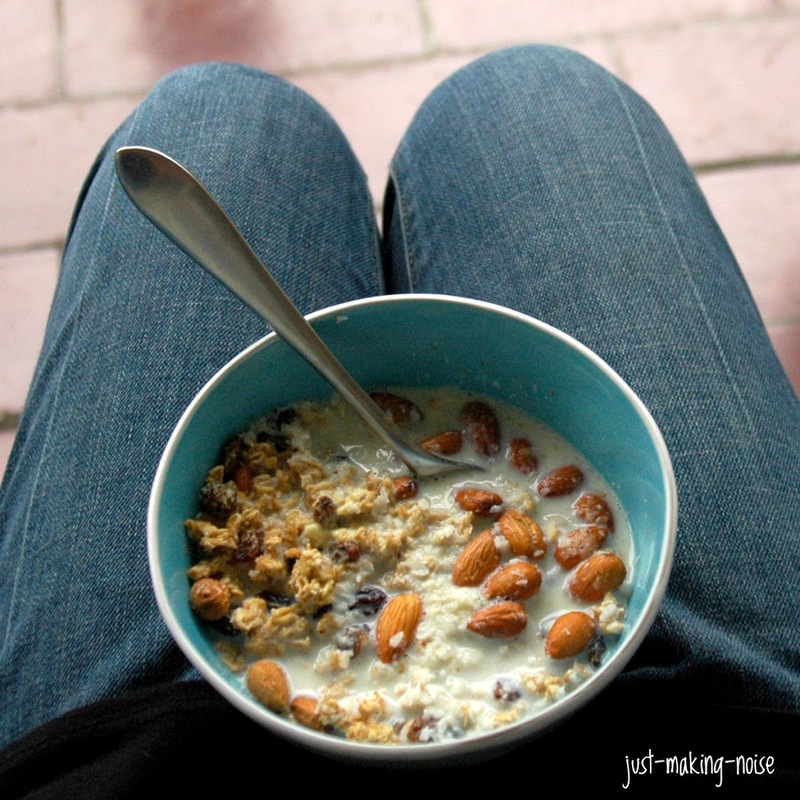 I warmed up my raw milk and poured it over my cereal, creating an almost “instant” oatmeal! It wasn’t much different from eating oatmeal porridge. You can use cold milk… which I made last night for a night snack and it was perfect! Mix all the dry ingredients in a bowl. Drizzle raw honey over the mixture and stir some more. Pour your choice of milk (warm or cold) over the cereal and ENJOY! Be creative or make your favorite! That is so true about cereals. It’s so sad to say that a lot of people are still buying it. And I used to eat them too but I don’t feel nourished at all. I’m after the convenience. I prefer the word nourishing than convenience. I need a dehydrator soon. It could a lot of things. Thanks for wonderful recipe. It brings a smile to my face. This looks so good Mare! I have never really been a cereal for breakfast kind of girl. Although I do sometimes, enjoy it for dessert…but that is even rare. But this cereal looks very yummy. Thanks for sharing. Hey! Really enjoying your blog, which I just discovered last week. I love “Nourishing Traditions,” too, and have told loads of people about it, but am only just recently trying a few of the recipes out. I would also love to pass this blog on to people, but I can’t because I have a hard time believing the results of this “unpublished study” from the 1960’s. If there’s no way to prove this study ever existed, how will other people come around to believing its admittedly far-fetched results? I’m very much for encouraging people to avoid processed food in all of its forms, and this information is truly fascinating, but to get other people to truly change their ways I need substantiated studies. Are there any out there? Jenn – Thanks Jenn :o) I know what you mean… there are rare moments when I want to snack on a bowl of cereal, but would always feel sick afterwards. Now I can enjoy this once or twice a week! Woo hoo!! Lydia – you have good questions and I would like to look into it more. One thing to think about… Do the cereal companies WANT this information out??? It would more or less destroy them… so I don’t think so :o) You can check out Paul Stitt’s book “Fighting The Food Giants”. Also, what about all those “unpublished” studies out there that we know support our nourishing diets? I know they have been doing studies on coconut oil and only found excellent results… so instead of admitting they were wrong about coconut oil.. they simply published lies like so many other companies. Bottomline, it all about the money. i also rarely eat cereal in the mornings, but sometimes i do miss that sweet, and quick, bowl of crunchy goodness in cool milk. this is definitely the best way to indulge! Such an informative post! Marillyn, you’re the best. You’re so busy, yet you can still spent time in writing such detail post. Cheers. This sounds like a great way to start the day! I love granola but it’s so hard to digest, so recently I’ve started making my own granola with soaked oats. I’m also a fan of Nourishing Traditions – looking forward to reading more of your blog! Thanks for the article and recipe. I usually eat oatmeal for breakfast now, but have eaten the Kashi crunch in a pinch. 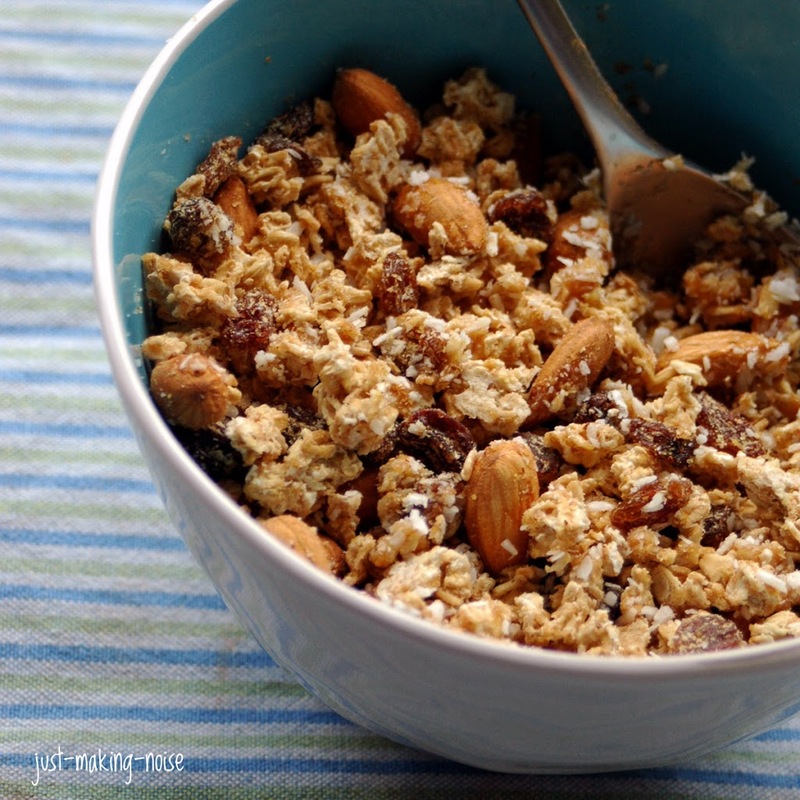 Your homemade cereal looks much better – Thanks for the inspiration! Oh dear! I am such a cereal girl. It is for convenience as I have to run out the door every morning for work. Maybe I just have rolled oats for now. I wish I had more time to make my own but work work work…. ughh. I’m always hungry if I eat cereal, unless it’s a granola of sorts. This sounds yummy, and my kind of cereal! Love this post and the quotes. And your cereal looks absolutely delicious! Yummy. Brie – I know what you mean! It rarely happens now, but I used to have cravings for a quick, sweet, crunchy bowl of cereal :o) Now I am happy with my homemade version!! My Little Space – As always… it is good to see you around :o) Thanks for the encouragement! Jessie – I hope you will try this out! You’ll be hooked! Nancy – Nice to see you here!! Great to know that you are a fan of NT… that book rocks! It really does make a difference to soaked the oats, does it? Allison – I’ll keep that in mind. Thank you for your thoughts! Tasty – Same here! I use to feel like I would have to eat the whole box before feeling “satisfied”. I hope you make this! I’ve had a bad feeling about boxed cereals for years… I feel validated after reading your article, Mare. 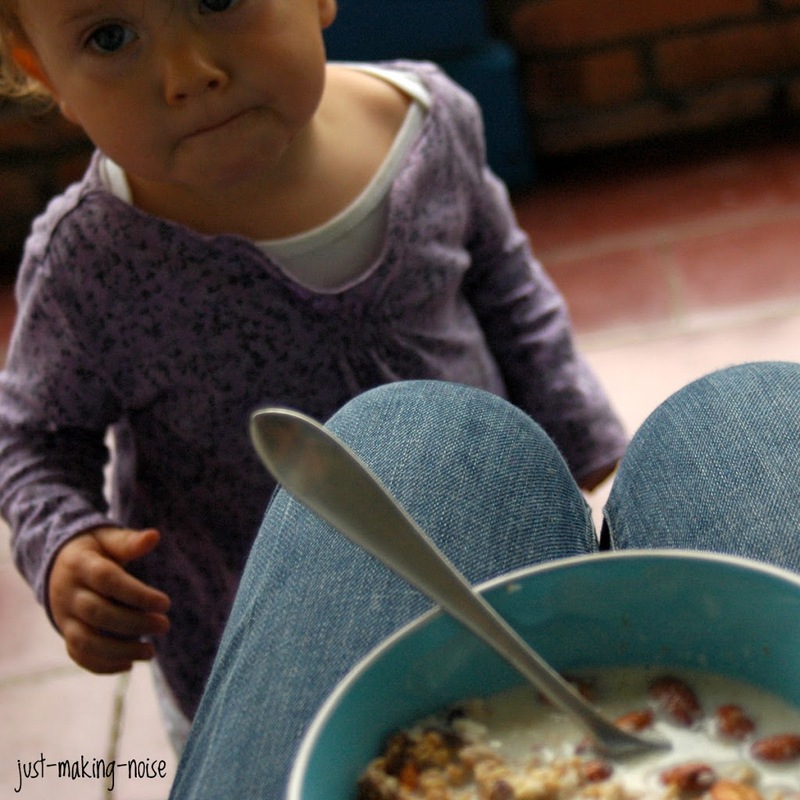 We’ve been sticking to soaked grains (like millet, buckwheat, and oatmeal)… I’m definitely not going back! wow there’s all sorts of wrong in the way we eat and the food we consume… but we do it anyway! I’ve been staying away from most cereal brands for a long time, but I’ve got a soft spot for Post Cereal, especially their whole wheat grains with pecans. I’m not sure how “good” that is for you now, reading this! What’s worse, I read the part about the lab rat + cereal and cereal box studies. They designed that experiment as a joke?? Makes me feel all wrong inside…. It may be worth noting that the boxes that ready-made cereal comes in are treated with chemicals to dispel bugs and rodents. These cereal makers cannot afford (right) to lose huge amounts of boxes in storage of their cereals in warehouses to rodents and bugs. As we all know, rodents will happily tear into a box of cereal take two bites, then move onto the next box, rather than carefully consuming the entire box. Make your own cereal and live longer!